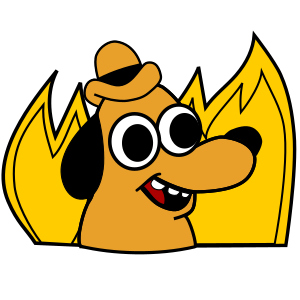 Since I use Jenkins regularly I thought it would be fun to make my Jenkins dashboard a bit more interesting by replacing all the build status icons with the This Is Fine dog (above). I traced a vector version of the iconic dog from the meme comic and modified the green balls plugin so that it replaces all build icons with my new vector icons. If you too want to spice up your Jenkins, download the plugin from llbit/thisisfine-plugin on GitHub. Ideally I would petition for the plugin to be hosted on the official Jenkins plugin site, but I doubt they will see the need for this plugin so that would probably be a futile quest.